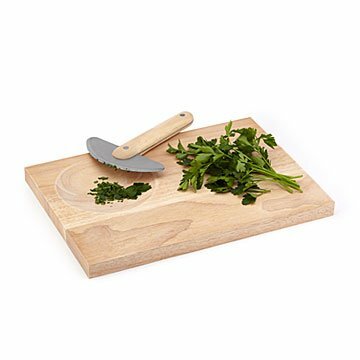 This rounded knife fits the hollow of the board, making it easy to chop herbs with one hand, mess-free. Piney, lemony, woodsy, pungent... the aromas of fresh herbs add an irreplaceable dimension to foods. But the hassle and mess of chopping them properly can make a cook think, "Maybe next time..." These tools make it so easy, you can even do it with one hand. The stainless steel knife's rounded blade fits perfectly into the hardwood board's concave cutting surface, keeping herbs—and nuts, garlic, onions, or veggies—in place as you work the blade. (Safety bonus: The design keeps fingers away from the sharp edge.) There's plenty of space for chopping with a standard knife, too. Both experienced and novice cooks will appreciate being able to prep great meals with less effort. Designed in Italy. Made in China.